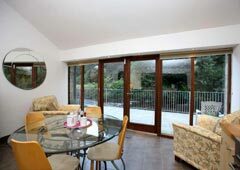 Woodland Barn is a luxury detached holiday accommodation sleeping 4. 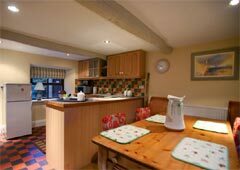 Woodland Lodge and Woodland Cottage are both charming cottages sleeping 4. 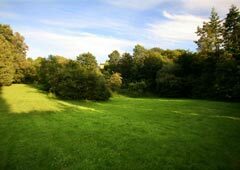 All pet friendly properties are on the fringes of Burton-in-Lonsdale in a tranquil setting in extensive grounds which include a delightful stretch of the River Greta, a large grassed area and woodlands managed by a local Woodland Trust. 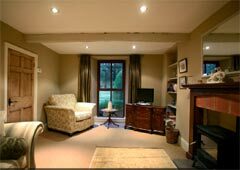 Woodland River Cottages offer free fishing and easy access to the spectacularly scenic Yorkshire Dales Three Peaks, the Trough of Bowland and the Lake District. 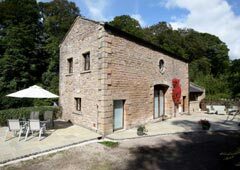 Woodland Barn sleeps 3 with 2 bedrooms: 1 x double, 1 x twin with en-suite shower room. Bathroom with bath, shower over, basin and WC. Dining kitchen with french doors onto riverside terrace. Living area with wood-burning stove and french doors onto riverside terrace. Downstairs cloakroom/WC. Underfloor heating throughout downstairs areas. Woodland Lodge sleeps 4 with 2 bedrooms: 1 x double, 1 x single. Bathroom with bath, shower over, basin and WC. Living area with well-equipped fitted kitchen, dining area and sitting area with oil fired coal-effect stove. Sun room. 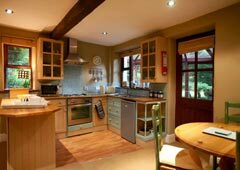 Woodland Cottage sleeps 4 with 1 double and 1 double ensuite. House bathroom with bath, shower over, basin and WC. Living area with well-equipped fitted kitchen, dining area and comfortable lounge with wood-burning stove and lovely aspect. All properties feature large shared garden/grounds with river access and woodland area, garden furniture and BBQ, fully equipped kitchens, automatic washing machine and tumble dryer, cot and highchair available on request, TV, DVD player, music centre, all fuel, power, bed linen and towels included in the rent, parking area, storage for bikes and Wifi. The cottages are just half a mile from a shop and a pub and they are dog friendly.